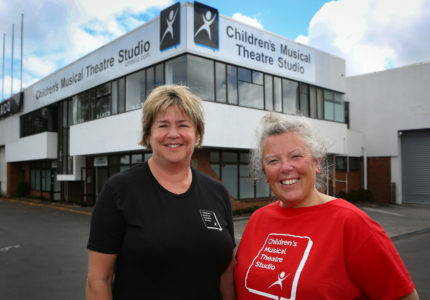 Children’s musical theatre is a powerful art form that can transform children’s lives – and who should know that better than Susanne Dell and Lynette Leggett who have practically devoted their lives to helping children bring out the creative best in them on and off stage. Sitting in their new spacious studio at 90 Springs Road, East Tamaki with ample space for dance, rehearsals, costumes and a grand piano, the women have been helping children and adults learn theatre craft. They are visibly excited about the new premises of the Children’s Musical Theatre Studio. Proudly pointing to the dance floor, frosted windows and the grand signage outside, Sue – a trained dancer who started teaching tap dancing when she was only 13 – says she has worked in theatre for more years than she can remember. Lynette is a talented primary school music teacher with many years of musical direction and stage management who has returned from a sabbatical overseas in Mexico. Together they take immense pride in instilling confidence in children and seeing the magical transformation in them as they take the curtain call. “We make sure that in all our productions everyone has a chance to shine,” they say. Currently they are auditioning for the cast of upcoming productions, The Addams Family for 13-16-year-old, and the all-time favourite Disney’s High School Musical Jr., for 8-12-year-old. With a cast of 20 for The Addams Family and 60 for Disney’s High School Musical Jr, they say that every child deserves to have an opportunity. Making sure that they start discovering the love for the performing arts from a very early age, the Dots for Tots class (from three months to four-years-old) is for parents and babies to learn songs, dancing and the beat. For preschoolers there is Tap for Tots – tap classes for two to four-year-old. There’s even a seniors dance class for adults on Wednesdays from 11am to 12noon as well as age group choirs for five-year-old who may be stage shy but are happy to be introduced to tools of musicianship.